This Hardinge R8 round smooth collet is used to hold workpieces in a lathe or other machine tool. It has a through-capacity of 3/4 inch, a back bearing diameter of 15/16 inch, and an overall length of 4 inches. The collet has external right-hand 0.437 inch x 20 threads for connecting to the draw bar, and the threads are heat-treated for long life. It is made of spring-tempered steel that has been hardened and ground for accuracy and resistance to wear and breakage. 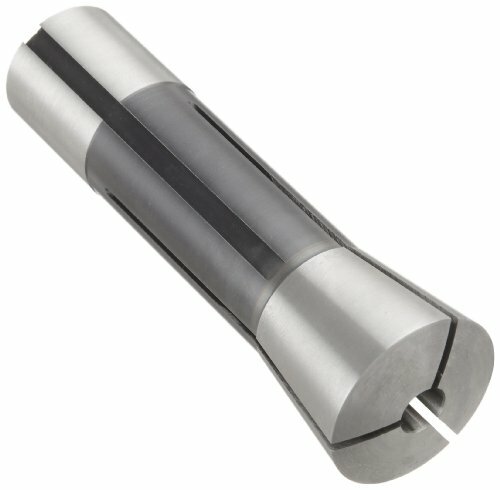 This collet is used to hold metals, plastics, carbide, graphite, and ceramics in industrial manufacturing applications. Collets are cone-shaped sleeves used to hold rodlike workpieces, or the shafts of tools, in the spindles of lathes, mills, or other machine tools. They are typically made of spring steel with one or more slots along the length to allow expansion and contraction, and have a center hole that is cylindrical, square, or hexagonal. A tapered collar tightens the collet to provide a fast, strong clamping action and accurate centering for low runout, making it ideal for high-volume production of precision parts. An expanding collet is used to hold a part on its inside surface so that it can be machined on its outside surface. Collets are used in applications such as the manufacture of metal and wood parts, semiconductor fabrication, and crafts, among others. Hardinge Inc. manufactures turning, milling, grinding, and workholding products. The company, founded in 1890, is headquartered in Elmira, NY, and meets International Organization for Standardization (ISO) 9001 standards for quality assurance. If you have any questions about this product by Hardinge, contact us by completing and submitting the form below. If you are looking for a specif part number, please include it with your message.